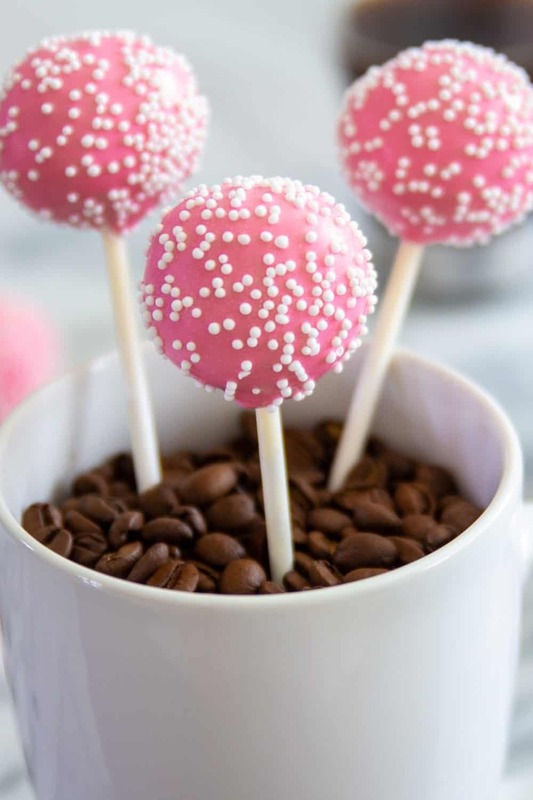 This cake pops recipe is a copycat of Starbucks’ birthday cake pop. If you’ve ever been to Starbucks you more likely saw they’re famous pink “birthday cake pops” through the glass of sweet goodies. This little treat is a combination of vanilla cake, frosting, and pink candy coating. 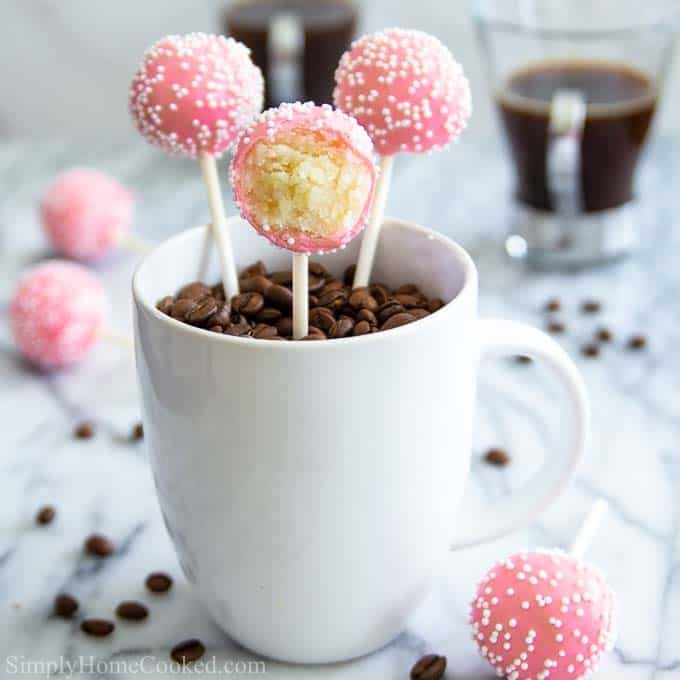 This easy to follow video tutorial will help you learn all the tips and tricks on how to make the best copycat Starbucks Birthday Cake Pops right at home. If you’re planning to make these bite-sized treats for a party, be sure to try my easy raspberry macarons, berry tartlets, and walnut chocolate chip cookies! This recipe was originally posted on Apr 30, 2015, we’ve tweaked it a bit since then. Bake the vanilla cake, let it cool and remove the outer brownish layer with a knife. Crumble the cake into small pieces and mix it with the frosting. Form the crumbs into cake balls. Dip the end of a cake pop stick into melted candy melts and insert the stick halfway through each cake ball. Freeze the cake pops for 15 minutes. Pour melted candy melts into a tall narrow cup and dip each cake pop into the candy melts. Then tap off excess candy and sprinkle with nonpareils. 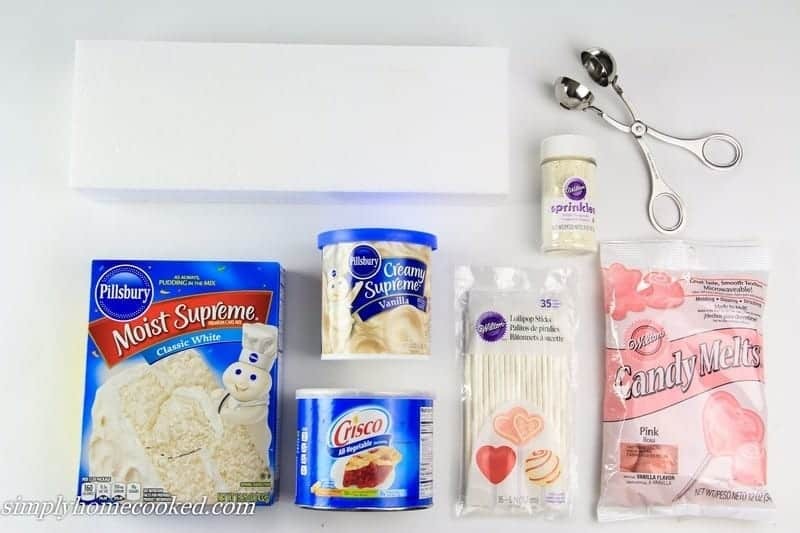 Place the finished cake pops into a block of styrofoam so that it can cool and stiffen. A cake pop is pretty much a baked cake that is crumbled into fine pieces, then it is mixed with frosting. After that, it is compressed into a cake ball. Then it is placed on a stick and dipped in melted candy melts. A good way to know if the frosting and cake crumbs are well combined is by compressing a handful and checking to make sure there’s no more marbled frosting visible. Remove and discard the outer layer of the baked cake. It tends to be drier than the rest of the cake, therefore it can cause the cake ball to fall apart. If your candy coating is too thick after melting, add some kind of shortening such as crisco or coconut oil to thin it out. When you dip the cake pop into the candy coating, don’t swirl the cake pop around. Instead bring it straight down, dip, and slowly bring it back up, so it doesn’t break apart. After the cake pops have been dipped into the melted candy, quickly tap the hand that’s holding the cake pop to help release any excess candy melt. Store the cake pops at room temperature in an airtight container. Refrigerating will cause condensation to form over the cake pop. 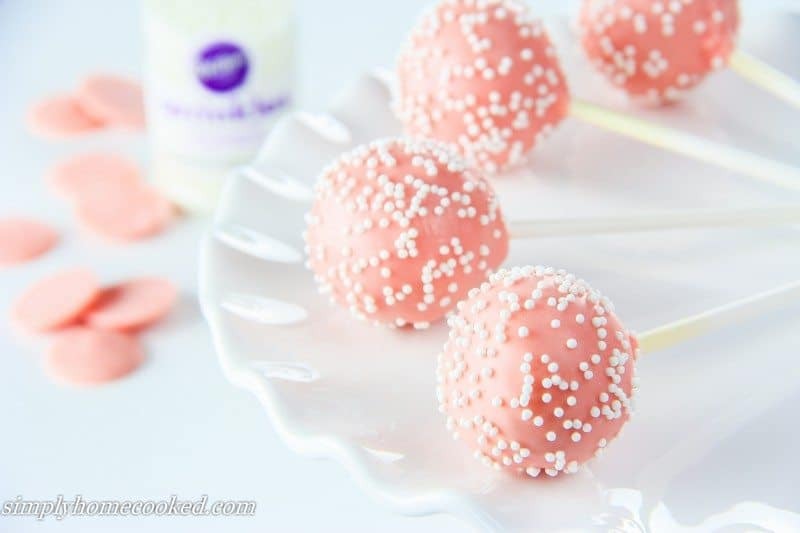 This cake pops recipe is a copycat of Starbucks' birthday cake pop. If you’ve ever been to Starbucks you've more likely seen they’re famous pink “birthday cake pops” through the glass of sweet goodies. This little treat is a combination of vanilla cake, frosting, and pink candy coating. Bake the cake according to the package and leg it cool down to room temperature. Cut the cake into 4 pieces and peel away the browned outside layer of the cake. I peel off the outer layer because it tends to be too dry to form the cake pop. In a large bowl, crumble the cake with your hands. Add 2 tbsp of frosting to the crumbled cake and mix with a spoon or your hands. 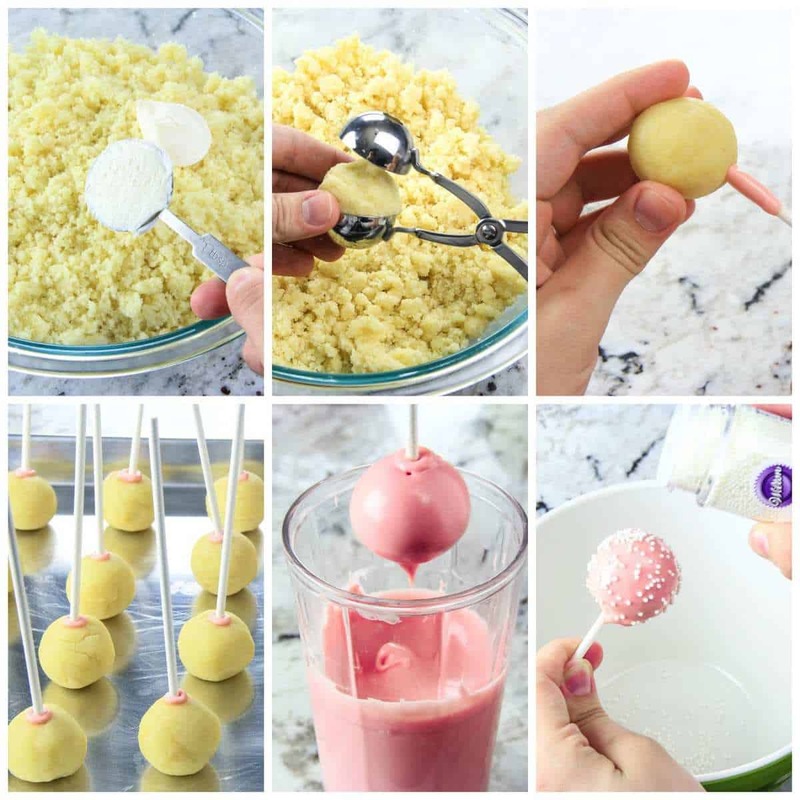 Shape the cake into balls and place them into the cake pop former. Make sure the cake ball is a little bit bigger than the size of the press. Once the cake ball is pressed tightly, remove extra cake from the sides and roll the ball with your hands to smooth any imperfections. Melt about 1/4 cup of candy melts in a small bowl. Heat in 30 second intervals to avoid overheating the candy. 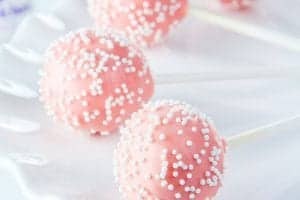 Dip the tip of each cake pop stick into the melted candy and poke it into to ball about half way through. Place each cake pop onto a baking sheet and transfer to the freezer for about 20 minutes. Meanwhile, melt the rest of the candy in a bowl. Make sure you melt them in 30 second intervals with mixing in between. Once it's melted well, add 1 1/2 tsp Crisco shortening and mix well with a whisk or fork. Then pour the melted candy into a tall narrow cup. 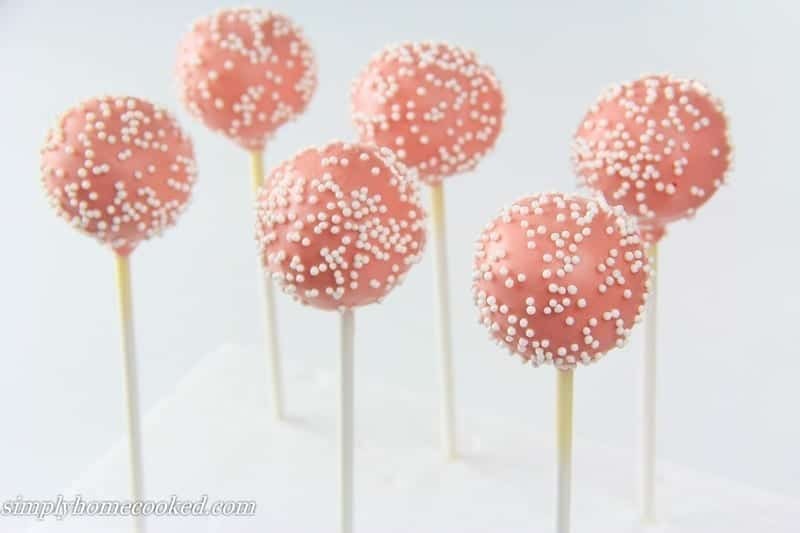 Once the cake pops have been in the freezer for 20 min, dip each into the cup and tilt to the sides slowly to make sure the entire cake pop is covered. Then slowly pull up the cake pop. (Don't swirl the cake pop) Hold the cake pop in one hand and tap your wrist so that all the extra melted candy drips off. Sprinkle the pop right away so that the sprinkles stick to it before the candy hardens. Place in a Styrofoam block and let it stand for about an hour. Store the cake pops at room temperature. Refrigerating will cause condensation to form over the cake pop. Ps: We’ve updated some of the photos in this recipe, here are some of our old images. Made these for my moms birthday and they were a huge hit! Displayed them in a tin bucket like a bouquet, placing the pops through cupcake wrappers to look like flowers. It was beautiful! Wish I could post a pic, but don’t seem to be able to. Martey, I am so happy to hear your vanilla cake pops turned out well 🙂 Thank you so much for leaving feedback! Hello what could I use instead of shortening and coconut oil could i use vegetable oil? Hi Mattie, vegetable oil will work well. Hi, can I use this recipe in a cake pop maker? Hi Devika, I don’t think this recipe will work in a cake pop maker because the cake gets baked first then mixed with frosting. do u have a recipe for homemade frosting as they dont sell readymade frosting where i live. (Outside USA). Also, is there anything else apart from coconut oil i can use to thin my melted white chocolate? Thank you Hayley, I’m so flattered 🙂 Enjoy! Hey Dina, I had a few questions for you. What do you use the styrofoam for? I had another question. 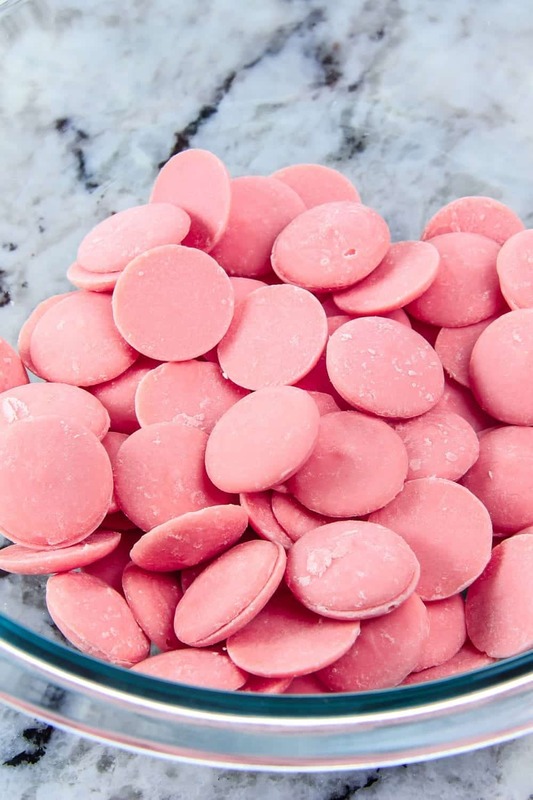 Can you use different color candy melts or does it have to be pink? Hi Aaliyah you can use any color you like. I use the styrofoam to keep the finished cake pops in place as they stand upright in the Styrofoam. Thank you, thank you for your recipe. My girls love cake pop from Starbucks so every time we go there, they always want it. But I’m not so much with my pocket. Your recipe saves me!! I made this many times and it always came out perfect just like from Starbucks. I baked again this afternoon and will bring it to my friends’ kids tomorrow. Thank you so muchhh!!! Awe I’m so glad your girls love them 🙂 Thank you for taking the time to write such a nice review! Can the dough be stored in the freezer and if so for how long before I need to frost them? Also how long should I let them get room temperature? Hi Kimberly, I’ve never tried putting the dough in the freezer. But I don’t see why it wouldn’t still work. If you do freeze the dough, I would keep it in an airtight container no longer than a week. Give it at least 1 hour to thaw before molding it into balls. I had trouble with thinning out the chocolate regardless of how much coconut oil I added it would harden before I could put sprinkles on the cake pop. Other than that out of 1 box I got about 15 to 18 pops I think they were too big. Please help! Hi Sherry, sorry for the delayed response. Did you try heating the chocolate again? maybe it just needed a little more heat? Hi Sherry, I’m so glad they worked out and everyone loved them 🙂 shoot me an email of your photo to simplyhomecooked@yahoo.com I would love to see them! Hi Adelaide, I’m happy you found this recipe easy to follow.